Lymphoepithelioma was first described in the nasopharynx by Regaud, Reverchen, and Schminke in 1921 however, this disease could be diagnosed in any organ. Breast lymphoepithelioma was first reported by Kumar and Kumar in 1994., Lymphoepithelioma-like carcinoma (LEC) is an undifferentiated carcinoma with a malignant epithelial component and lymphocytic infiltrate., Lymphoepithelioma of the nasopharynx is associated with Epstein–Barr virus but lymphoepithelioma of the breast is not associated with this virus. The presence of this tumor represents a diagnostic challenge, and given the rarity of the disease, there are no standard treatments., This report adds one case to the literature on LEC and includes an analysis of this unusual tumor. This report describes the case of a 57-year-old Hispanic woman, whose sister had breast cancer diagnosed at age 48. She consulted for a tumor that was self-detected 2 months before on her left breast. Mammograms and ultrasound confirmed the presence of a mammary tumor, classified as the Breast Imaging-Reporting and Data System 4; an excisional biopsy was performed confirming the presence of ductal carcinoma of 4 cm in diameter at its maximum axis. At our institution, imaging studies showed residual disease in the breast and the pathologic revision reported lymphoepithelioma; simple mastectomy and sentinel node were performed. Pathology reported the presence of residual disease of 2.1 cm, and sentinel node was negative. The description of the surgical specimen showed infiltration of mature round lymphocytes, with few plasma cells, large cells with abundant pale cytoplasm, with prominent nucleus vacuolar nuclei. Negative sentinel node was present [Figure 1]. Immunohistochemistry showed epithelial membrane antigen (EMA), GATA, CD3, CD8, CD20, CD138 positive, CK5/6, CK7, CK17, GCDFP-15, EGFR, claudin, E-cadherin, B-catenin 21, CD23, ALK, C-kit negative, estrogen receptor positive (ALLRED 4), progesterone receptor positive (ALLRED 7), HER2 negative, and Ki67 20%, and p53 60% [Figure 2]; these results confirmed the diagnosis of primary breast lymphoepithelioma. At 6 weeks of surgery, the patient received adjuvant chemotherapy, based on four cycles of TC (docetaxel 75 mg m2 and cyclophosphamide 600 mg m2) every 21 days followed by radiotherapy at the breast with a dose of 45 Gy in 25 fractions. She is currently receiving adjuvant letrozole and she is free of disease and asymptomatic at 17 months of follow-up. Intentional search was carried out in PubMed/MEDLINE and Google Scholar databases with the keywords “lymphoepithelioma-like AND breast cancer;” we found 35 publications, and three were excluded because they were not LEL of the breast; [Table 1] shows the characteristics of the 32 cases found as well as the one that occupies us in the present case report. Lymphoepithelioma is an undifferentiated carcinoma that was originally described in the nasopharynx but has been described in other organs. LEC was first described in 1994, given the similarities between the mammary tumor and the nasopharynx. Of the 33 cases reported in the literature, including the present case, the mean age was 52 years (37–69 years); no cases have been reported in males. To date, the etiology is unknown, and the Epstein–Barr virus has been associated with nasopharynx;, however, the presence of this virus has not been documented in the published cases of LEC, and there are two cases described associated with papillomavirus. In mammography, we can see an ill-defined mass, focal asymmetry, or hyperdense lesion. Tomography may show a heterogeneous mass of low density; however, it is difficult to differentiate LEC of the conventional neoplasia by clinical and imaging studies. In our revision, mean tumor size was 25 mm (10–43 mm); 57.57% (n = 19) occurred on the left breast, 60.60% (n = 20) was clinical Stage IIA, 27.27% (n = 9) IA, and 6.06% (n = 2) IIB, and in 6.06% (n = 2), clinical stage was not specified; 21.21% (n = 7) had lymph node involvement [Table 1]. Histologically, LEC shows an infiltrate similar to lobular carcinoma, and even some authors have described it as a subtype of invasive lobular carcinoma by the presence of scattered epithelial cells (Schmincke pattern), but the difference is that the infiltrating lobular carcinoma is characterized typically by small and uniform cells arranged like a “Indian row;” while in LEC, the tumor cells are much larger and pleomorphic, it has also been described that it has an intense lymphocytic infiltration that obscures the presence of the epithelial component. LEC must be differentiated from Hodgkin's lymphoma, which lacks epithelial components, although it is difficult to differentiate a malignant epithelial component from mononuclear lymphoid cells. Immunohistochemistry for cytokeratins (CKs) and EMA is useful for showing the nature of epithelial cells found between lymphocytes and plasma cells. It should also be differentiated from medullary carcinoma, which is described with the following characteristics: syncytial growth pattern > 75%, diffuse, complete circumscription, diffuse mononuclear stromal infiltrate, nuclear pleomorphism, and absence of microglandular features. Another entity for the differential diagnosis is predominantly lymphocytic breast cancer, and it can harbor a dense lymphoid infiltrate but lacks the nuclear characteristics and the syncytial nature of LEC. Of the 33 cases evaluated, 33.33% (n = 11) had estrogen receptor expression and 18.18% (n = 6) progesterone receptor, and 6.06% (n = 2) had overexpression of HER2 [Table 1]. LEC is a breast cancer subtype considered part of the spectrum of triple-negative tumors, due to the presence of basal CK (dominant expression of CK5/6 and lower CK14), but LEC has been shown better prognosis like medullary carcinoma. As in other types of breast cancer, the primary treatment is surgery, in most cases described, the initial treatment was conservative surgery or mastectomy. 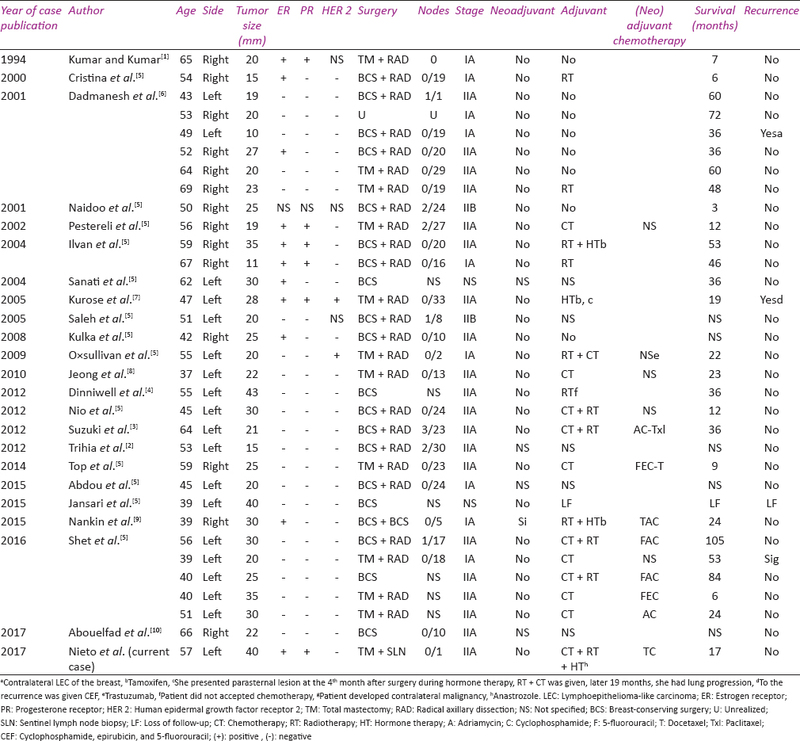 According to our review, 60.60% (n = 20) were treated with conservative surgery and 36.36% (n = 12) with mastectomy, and the rest did not report the type of surgery [Table 1]. Only one patient received neoadjuvant chemotherapy with taxotere, adriamycin, and cyclophosphamide (TAC) regimen regimen (; 57.57% (n = 19) received any type of adjuvant, 12.12% (n = 4) received radiotherapy only, 18.18% (n = 6) received chemotherapy, 6.06% (n = 2) received radiotherapy and hormone therapy, 15.15% (n = 5) received chemotherapy followed by radiotherapy, 3.03% (n = 1) received chemotherapy followed by radiotherapy and adjuvant hormone therapy, 1 patient presented sternal recurrence to the 4th month of initiation hormonal therapy and therefore received chemotherapy and radiotherapy. Of the patients who received hormone therapy, 3 received tamoxifen and 1 received aromatase inhibitor; 12 patients received chemotherapy, 8 received schemes based on anthracyclines and taxanes, and other four patients received any chemotherapy, but it was not specified. In metastatic disease, one regimen has been described (cyclophosphamide, epirubicin, and 5-fluorouracil) administered in a patient who presented recurrence in the chest wall but subsequently developed pulmonary metastases. These patients have been described with good prognosis. Local recurrences were documented in three patients, and one of these developed visceral (lung) metastasis. Of the cases reported, all the patients were alive, the mean global survival was 30.59 months (3–72) [Table 1]; although 33 cases are described, this entity seems to have a good prognosis, and this may be due to lymphocytic infiltrates, indicating cell-mediated immune reactions. Kumar S, Kumar D. Lymphoepithelioma-like carcinoma of the breast. Mod Pathol 1994;7:129-31. Trihia H, Siatra H, Gklisty H, Diamantopoulos P, Arapantoni-Dadiotis P, Kalogerakos K, et al. Lymphoepithelioma-like carcinoma of the breast: Cytological and histological features and review of the literature. Acta Cytol 2012;56:85-91. Suzuki I, Chakkabat P, Goicochea L, Campassi C, Chumsri S. Lymphoepithelioma-like carcinoma of the breast presenting as breast abscess. World J Clin Oncol 2014;5:1107-12. Dinniwell R, Hanna WM, Mashhour M, Saad RS, Czarnota GJ. Lymphoepithelioma-like carcinoma of the breast: A diagnostic and therapeutic challenge. Curr Oncol 2012;19:e177-83. Shet T, Pai T, Shetty O, Desai S. Lymphoepithelioma-like carcinoma of breast-evaluation for Epstein-Barr virus-encoded RNA, human papillomavirus, and markers of basal cell differentiation. Ann Diagn Pathol 2016;25:42-7. Dadmanesh F, Peterse JL, Sapino A, Fonelli A, Eusebi V. Lymphoepithelioma-like carcinoma of the breast: Lack of evidence of Epstein-Barr virus infection. Histopathology 2001;38:54-61. Kurose A, Ichinohasama R, Kanno H, Kobayashi T, Ishida M, Nishinari N, et al. Lymphoepithelioma-like carcinoma of the breast. Report of a case with the first electron microscopic study and review of the literature. Virchows Arch 2005;447:653-9. Jeong AK, Park SB, Kim YM, Ko BK, Yang MJ, Kwon WJ, et al. Lymphoepithelioma-like carcinoma of the breast. J Ultrasound Med 2010;29:485-8. Nankin NL, Gondusky CJ, Abasolo PA, Kalantari BN. Lymphoepithelioma-like carcinoma of the breast. Radiol Case Rep 2015;10:963. Abouelfad DM, Yassen NN, Amin HA, Shabana ME. Lymphoepithelioma-like carcinoma of the breast mimicking granulomatous mastitis – Case report and review of the literature Asian Pac J Cancer Prev 2017;18:1737-41. Kulka J, Kovalszky I, Svastics E, Berta M, Füle T. Lymphoepithelioma-like carcinoma of the breast: not Epstein-Barr virus-, but human papiloma virus-positive. Hum Pathol. 2008; 39:298-301.